When you work at home, anything and everything can become a distraction: dogs barking at the mailman, unexpected visitors, sudden solicitors. You don’t need the children to be home to create distractions for you because the universe does a pretty good job of wrecking your work from home routine on its own. 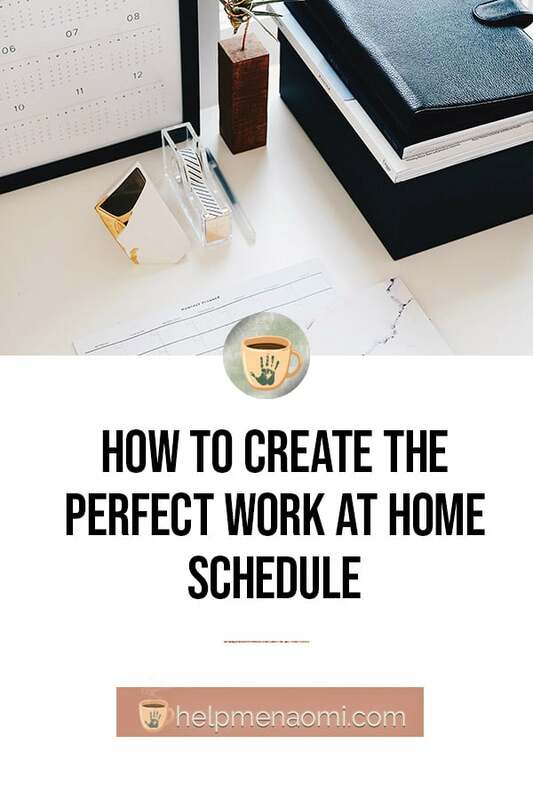 So imagine how pleased I was when I discovered the secret to creating the perfect work at home schedule. I’m just kidding – there is no such thing as a perfect work at home schedule that works for everyone. But with time-blocking, you can get pretty close. Why not just work while everyone else is sleeping? Yes, I know this is one of the most popular pieces of advice floating around the internet today: just wake up before everyone else wakes up and get some work done. Get some work done while the kids are napping. Stay up late after everyone else has gone to bed and get some work done. Um… if you’re always waking up early, staying up late, and skipping naptime so you can work, when do you sleep? These things may work for some people, but for most people, all you’re going to do is lose a lot of sleep and end up groggy and grumpy. And that won’t do anyone any good. 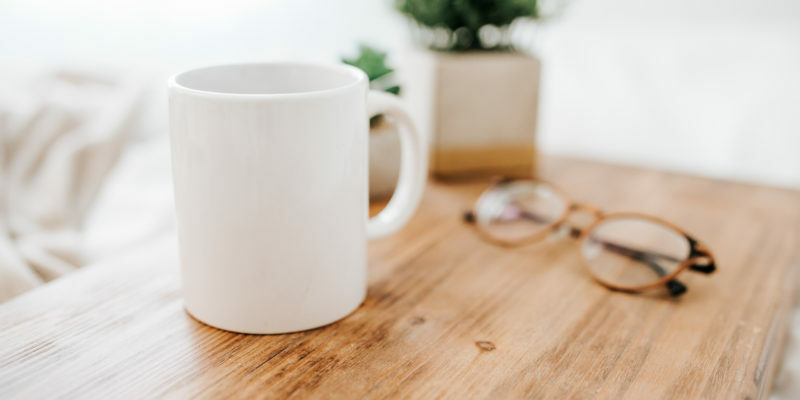 I prefer building a work at home schedule that actually lends itself to productivity and allows you to feel as though you are accomplishing everything you’ve set out to do without feeling as if parts of your life are being neglected. And isn’t that really the goal, here? To create a sense of balance between work and life without neglecting either one? Even if it helps you get through some deadlines, depriving yourself of sleep is the last thing you want to do if you’re trying to feel balanced. Additionally, everyone else’s sleep schedule is out of your control. You can’t possibly control whether or not your children will stay asleep when you get up to work, or that they’ll nap the same amount of time every day. Therefore, trying to get all your work done while they are sleeping is a horribly unreliable way of setting your hours. And trust me, there is little in this world as frustrating as having a deadline breathing down your neck on a day your child suddenly decides he or she (or both) can survive on 12 minutes of sleep for the week. Time-blocking allows you to build a more efficient schedule that can include everything. Day job, side hustle, mother duties, self-care… each of these can be integrated into your schedule. That’s part of what makes this method of time management so powerful. The idea behind time blocking is to set aside a block of time for each activity. Then, during that block of time, you concentrate on just that one activity. No distractions, no multi-tasking, no hopping from one browser to the next to the next. This means that when you’re spending time with your kids, your kids get your undivided attention. When you’re writing your blog, your blog gets your undivided attention. And the real benefit of this method is how flexible it is. If priorities change for any reason, you can move things around to keep up. 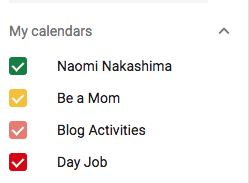 “Naomi Nakashima” – includes self-care, personal development or learning activities, and other activities that may overlap between the others such as checking email and processing times after meetings. 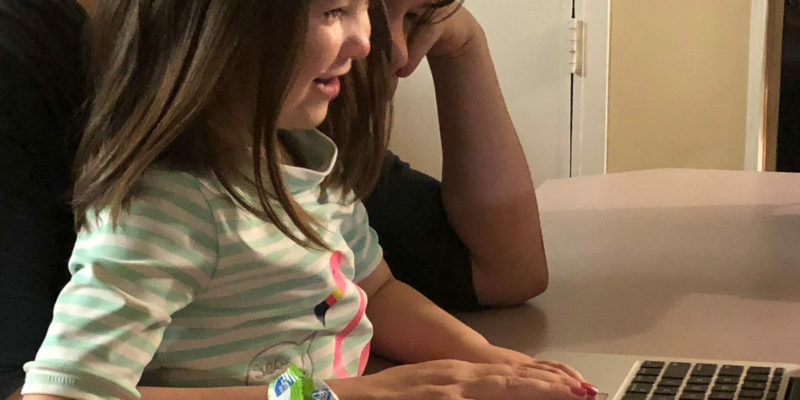 “Be a Mom” – as weird as this may seem to have this scheduled in this way, it includes activities with my kids, such as reading time, lunch, or even just playtime. “Day Job” – this one is probably obvious, it includes all activities related to my day job as a social media operations analyst for Sassy Suite. “Blog” – this one is also probably obvious, it includes all activities related to keeping this blog going, including the podcast, writing, graphics, and promotion. That notification is one of the most important parts – don’t forget that. Go through each of your responsibilities for each calendar and add those blocks in. And add these in how they would look in an ideal world. Only include your current responsibilities – don’t start adding in new things because it looks empty. The whole point of this is to make your schedule look and feel more manageable. Having some blank spots will do that. It doesn’t mean you’re lazy or not working hard enough. It means you’re leaving your schedule flexible. As you can see, I have my all-day events (Twitter Chats), followed by several blocks of time representing different parts of my day. And there is plenty of white space. The white space is crucial for last-minute emergencies, changes in priorities, or simply being on-call for my job. My computer and phone will remind me when I have a new block of time coming up, and when it’s time to start wrapping up so I can move to the next activity. 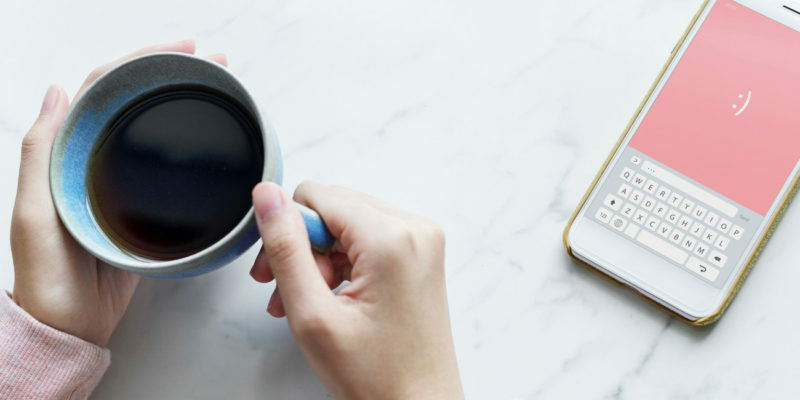 I’ve tried just about every method of time management, scheduler, planner, agenda, digital planner, bullet journal, and todo list manager available, both free and paid. This method allows me the discipline of having a rigid schedule while also giving me the flexibility to move things around as needed. Have you ever tried time blocking? How did it work for you? Gonna give it a try! Thanks Naomi!! I sure need more productivity in my day!! That’s great, Stacey!! Let me know how it goes! LOVE THIS! I live by my Google Calendar but had never thought to do the time blocking within it. I’m going to do this since my work schedule is erratic, this can help to ensure I get those important items checked off! Brilliant! Great! Don’t forget to come back here and let me know how it works out for you.